Bananas Foster Cheesecake Recipe | AMAZING Cheesecake Recipe! 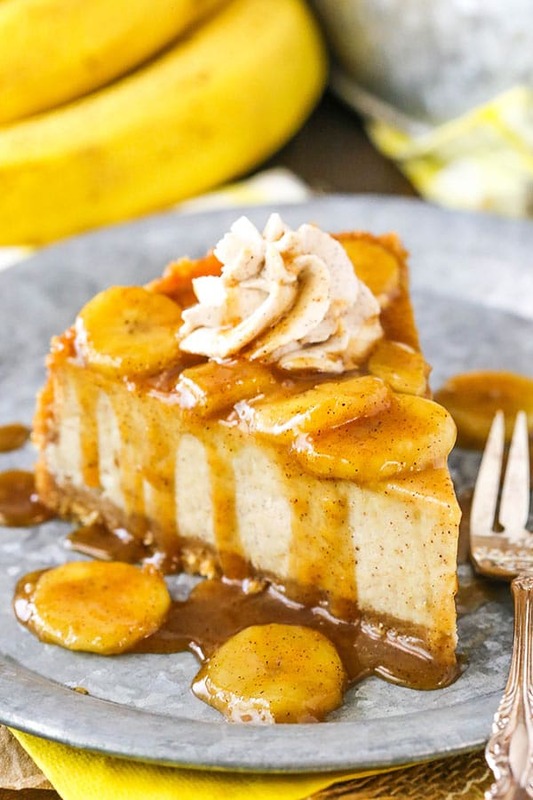 This Bananas Foster Cheesecake recipe is made with a thick and creamy banana brown sugar filling, cinnamon cookie crumb crust and bananas foster topping! It’s a wonderful combination of bananas, cinnamon, brown sugar and rum that makes the most AMAZING cheesecake! So I’m a little delayed in sharing this Bananas Foster Cheesecake with you. I actually wanted to share it back in October, but had so many fun pumpkin things I wanted to share before it was too late that it ended up being pushed back until now. After all, banana is great any time of year! But before my twin babies, this cookbook was definitely a baby of mine. It kept me up nights, had me up early and was a labor of love. And the first time I saw it in person was a great day and feeling. Even two years later, the recipes in it are some of my favorites. If you haven’t checked it out yet, you really should. And with the holidays coming up, it’d make a great gift for the bakers in your life! 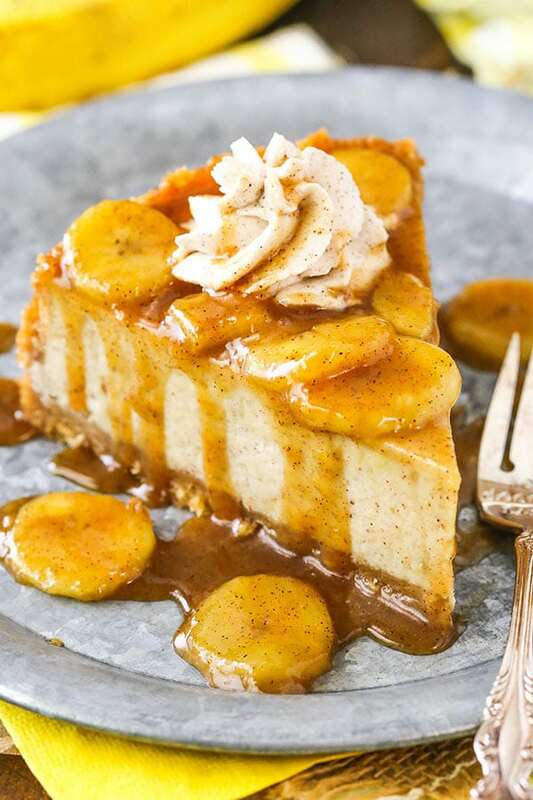 So to make this Bananas Foster Cheesecake, you’ll actually start with the crust. I made a slight change in the crust this time around and added some cinnamon. 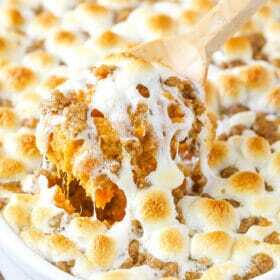 It’s now made with a combination of both brown sugar and cinnamon and I love the little addition. It just take the crust up a notch! The filling is made next and is full of brown sugar, cinnamon, nutmeg, a bit of rum and plenty of mashed bananas! So many amazing flavors, yet none of them overpower any of the others too much. You taste them all and they are decadent. The cheesecake is baked in a water bath, as I do with all of my cheesecakes. It’s the best way to ensure a creamy cheesecake that doesn’t crack, fall in the center, brown too much on the edges or dry out. Definitely the way to go, even though it adds a few more steps and a little baking time. After the cheesecake bakes, it should be refrigerated until cold and firm, then you’ll want to add the topping. 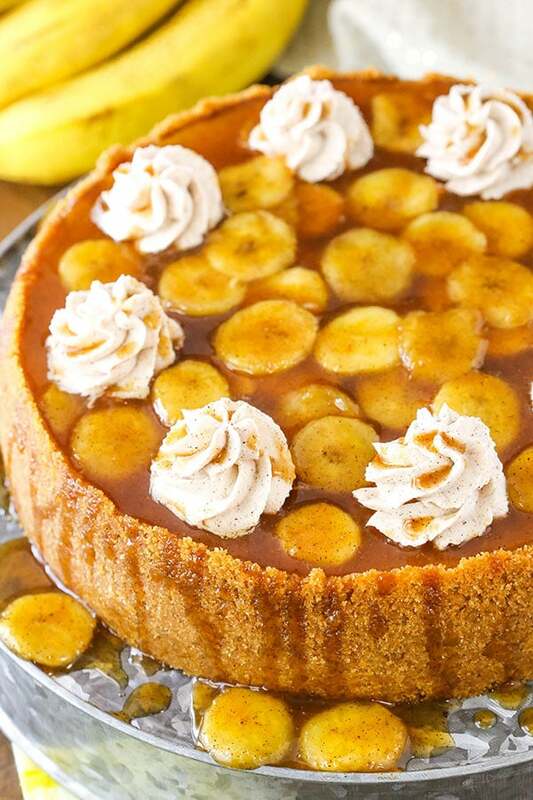 The topping of this Bananas Foster Cheesecake is exactly what you want it to be – bananas foster. One of my very favorite things and it’s so easy to make. You’ll combine butter, brown sugar, nutmeg, cinnamon and some heavy cream in a pan over the stove until the sugar has melted. Then you’ll add the rum and that’s when the magic happens. I definitely recommend a dark rum. You want to be careful for this next step when you light the rum. It makes a nice flame, so you’ll swirl the rum around the pan a bit and let it burn off. Next, add the bananas and let things cook for another minute or two to thicken up and you’re done! 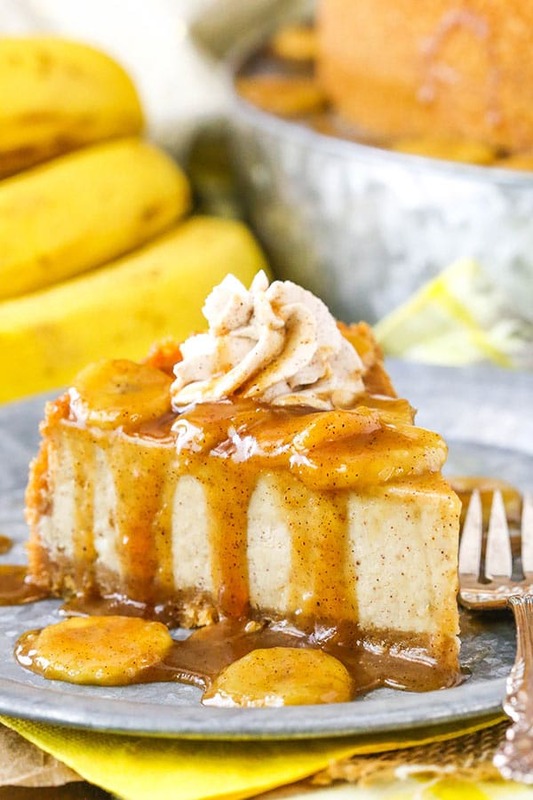 Easy, delicious bananas foster and it goes right on top of your cheesecake! This cheesecake is seriously amazing. Thick, creamy and FULL of flavor! One of my favorites from the cookbook and a recipe my dad goes a little nutty over every time I make it. If you’ve never tried a little rum in your baking before, this is definitely the time and the recipe. The dark rum has a little spice of it’s own that only adds to the flavor of the cinnamon and bananas and will have you taking just one more bite until you realize that you’ve taken all the bites and there are none left. All the flavors together just melt in your mouth and you can’t get enough. See a few other recipes from my cookbook. 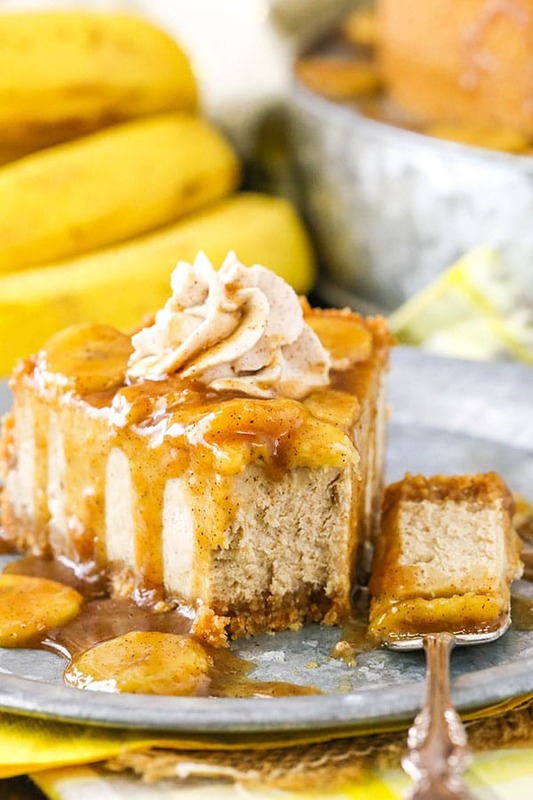 This Bananas Foster Cheesecake is made with a thick and creamy banana brown sugar filling, cinnamon cookie crumb crust and bananas foster topping! 3. Bake the crust for 10 minutes then remove from oven to cool. 4. Cover the outsides of the pan with aluminum foil so that water from the water bath cannot get in. See my tutorial for preventing a water bath from leaking. Set prepared pan aside. 6. In a large mixer bowl, blend the cream cheese, brown sugar and flour on low speed until completely combined and smooth. Be sure to use low speed to reduce the amount of air added to the batter, which can cause cracks. Scrape down the sides of the bowl. 7. Add the mashed bananas, cinnamon, nutmeg and dark rum. Beat on low speed until well combined. 8. Add eggs one at a time, beating slowly and scraping the sides of the bowl as needed. 9. Pour the cheesecake batter into the crust. 10. Place the springform pan inside another larger pan. Fill the outside pan with enough warm water to go about halfway up the sides of the springform pan. The water should not go above the top edge of the aluminum foil on the springform pan. Bake for 1 hour. 11. Turn off the oven and leave the cheesecake in oven with the door closed for 30 minutes. Do not open the door or you’ll release the heat. 12. Crack oven door and leave the cheesecake in the oven for another 30 minutes. This cooling process helps the cheesecake cool slowly to prevent cracks. 13. Remove the cheesecake from the oven from oven and let sit on the counter for 15 minutes. 14. Remove the pan from water bath and remove aluminum foil. Refrigerate cheesecake until completely cooled and firm, 6-7 hours. 15. When cheesecake has cooled, make the bananas foster. Melt the butter in a large pan over medium-high heat. 16. Add the brown sugar, nutmeg, cinnamon and heavy cream and stir until sugar is dissolved. 17. Pour the rum into the pan, then use a lighter to light the rum. Be careful, the flame can get somewhat high. Once lit, allow it to cook, swirling the pan a few times to disperse the rum and flames. It should burn out within a minute or two, but if not, swirl a little more to help it burn out. 18. Add the bananas to the sauce and continue cooking another 1-2 minutes to thicken the sauce. Remove from heat and set aside to cool and thicken before adding to the cheesecake. 19. While bananas foster cools, remove the cheesecake from the springform pan and set on a serving plate. 20. To make the whipped cream, add heavy whipping cream, powdered sugar and cinnamon to mixing bowl and whip until stiff peaks form. 21. Pipe a swirl border with the whipped cream around the outside edge of the cheesecake. 22. To finish off cheesecake, add the bananas foster on top, in the middle of the whipped cream. Drizzle the sauce over the bananas and down the sides of the cheesecake. 23. Refrigerate cheesecake until ready to serve. Cheesecake is best for 2-3 days because the bananas on top can spoil. This looks amazing! Could I make it two days in advance? Would you leaving the topping off till serving? Yes, you could make the cheesecake a couple days ahead. I’d suggest making the fosters topping shortly before serving, if you can, so it’s fresh. Can this be made without the rum? We don’t consume any alcohol. Yes, you could just leave it out. This looks fantastic, and congratulations on the two-year cookbook anniversary! We still pull the cookbook out at all the special occasions to choose something delicious. Enjoy this first set of holidays with the boys, Lindsay! What a wonderful time of year. Thank you Jennie! I’m so glad you enjoy the cookbook! I made this today and it was RIDICULOUSLY delicious. I brought slices to everyone in my family and all agreed this one is spectacular. I made the banana cheesecake with bavarian cream for Thanksgiving, and as soon as I saw this one, I had to make it, too. Everyone in my family preferred this one! I’ve got the lemon meringue cheesecake setting up in the fridge as I type this (butane arrives from amazon.com tomorrow). I am so happy I found this website, since I am now addicted to making cheesecake, and you’ve got lots more options for me to try. That’s awesome! I’m so glad you enjoy the cheesecakes! This cheesecake came out looking beautiful -picture perfect. I might not add as much mashed banana in the recipe as it was almost too much banana flavor since you serve fresh sliced bananas on the top anyway. It might taste better as a plain cheesecake with banana. Still, it is a very good recipe. I would make this again. Thanks for your recipe!! Oh goodness this looks so good! I am excited to try it! I always love the new and unique cheesecake flavors you come up with :). Hi Lindsay, the sugar that you use for the cheesecake filling, is it also lightbrown sugar or darkbrown sugar? Which run exactly do you use for this? Any dark rum should be fine. I’ve used several different ones and they all worked great. Hi Lindsay! 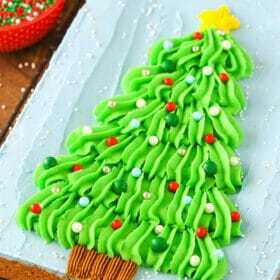 I really enjoy your site and have made many of your cakes & cheesecakes. 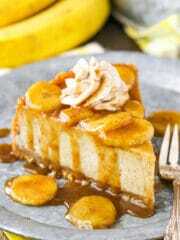 The Bananas Foster cheesecake looks and sounds awesome. I would like to make it for a family function and one of my niece-in-laws is gluten intolerant. What could I substitute the 3 Tbls flour with? I’m so glad you’ve enjoyed the recipes! You could use 1 1/2 tbsp cornstarch instead. I made this cheesecake along with the Strawberry Moscato Cake for Christmas, which I’m now required to make since last year when I made it everyone can’t stopped talking about it. This was the first time I ever made a cheesecake as my 12yr old son who makes them was away visiting family this year & everyone was expecting his cheesecakes. It came out amazing, in 5 mins half the cheesecake was gone. I have received text msg raving about this cheesecake. Thank you for your recipes. It lasts well for about 4-5 days. But if you’re making it ahead, I’d add the bananas foster topping before serving. You could really use them at any level of ripeness for inside the cheesecake. I’ve used yellow bananas and brown bananas and both were fine. More ripe can lend a little stronger flavor sometimes though. what is the difference between the heavy cream in the bananas foster and the heavy whipping cream in the whipped cream? do we need to purchase both or is it the same thing? You can use the same for both, I actually used heavy whipping cream for both and I have updated the recipe. Thank you! I hope you enjoy it! I made this cheesecake this weekend and it turned out AMAZING!!! I used a Jamaican dark rum and my only problem through the entire recipe was that I couldn’t get the rum to light in the pan? I even put some on a spoon and tried to light it by itself and it wouldn’t light, so there must have been something wrong with the rum I bought. The final cake had a slight alcohol taste but I really didn’t mind. I followed the cooling times just like you said and my cheesecake turned out perfect and didn’t crack!! This recipe will be saved in my recipe box forever! It may be a problem with the rum. Glad you enjoyed! Good morning, I wonder if this could be done by adding some of the ingredients to a no bake version! That might take a little playing with the recipe. 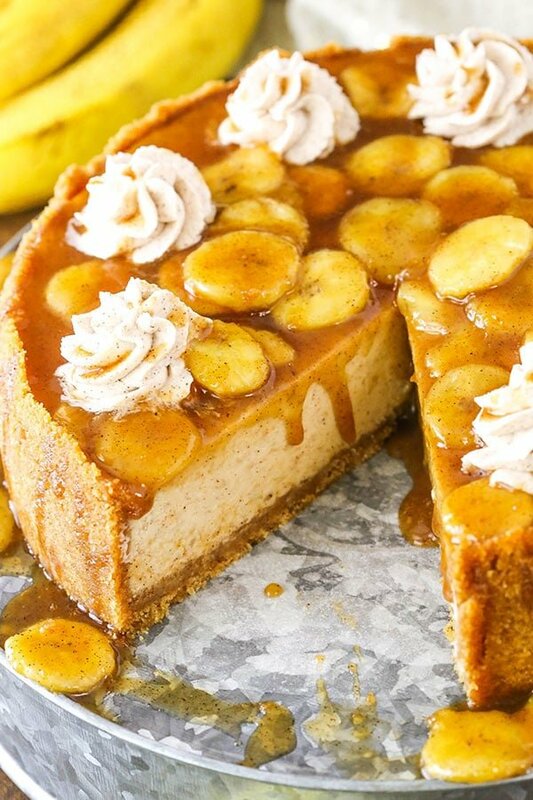 Adding bananas to a no bake cheesecake would soften it just a bit. You would probably want to add gelatin, and I don’t know if the bananas would brown a good bit. This was awesome!! Definitely make again. Held off putting banana’s on top so would keep longer. Added banana liqueor and rum in whip cream instead. Never too much rum. Yum! So glad you enjoyed the cheesecake! This recipe is amazing! Not to heavy but very flavorful. You could try it. I might also add 2-3 tablespoons of water, if you want the same consistency as the original recipe.